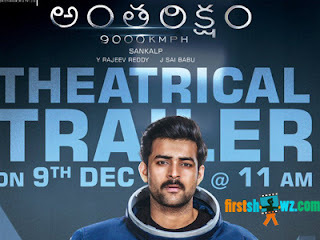 Varun Tej's ‘Antariksham 9000 KMPH’ India's first space thriller is gearing up for a release on December 21, targeting the Christmas season. The film also stars Aditi Rao Hydari and Lavanya Tripathi in the female lead roles. Now the latest news is Antariksham 9000 KMPH theatrical trailer will be launched on December 9. Antariksham 9000 KMPH trailer is being planned to be inaugurated at AMB Cinemas multiplex in Hyderabad. Sankalp Reddy of ‘Ghazi’ fame is donning the director cap for the movie, while Krish Jagarlamudi along with Y Rajeev Reddy and Sai Babu is jointly producing it under the banner of First Frame Entertainments banner. Antariksham 9000 KMPH has musical scores by Prashanth Vihari and cinematography is by Gnana Sekhar VS.